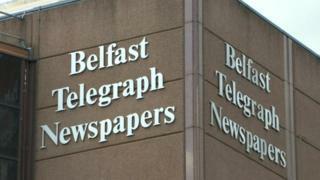 A scheme to redevelop the former headquarters of the Belfast Telegraph has been given planning permission. The £75m project is a joint venture between Belfast City Council and developers McAleer and Rushe. It is an office-focused scheme which will involve refurbishing the listed building and demolishing non-listed buildings on the one acre site. The Belfast Telegraph newspaper is now based in Clarendon Dock and its printing operations are in Newry. Part of the building has recently been used as a venue for dance music events. The new office development will be known as The Sixth and will include 230,000 sq ft of commercial space. It has been designed by the London-based architectural practice Allford Hall Monaghan Morris (AHMM). Suzanne Wylie, chief executive of the city council, said: "The aim of this joint venture is a strategic investment in the city, delivering workspace of a world class scale and quality for local or international occupiers. "Council has a particular focus on wellness and wellbeing within the Belfast Agenda, and the inclusion of a roof-top running track as part of this development, highlights the evolving nature and role of workspace in the city centre." Stephen Surphlis, property director at McAleer & Rushe, said: "We look forward to progressing the development as quickly as funding is in place to deliver the project."